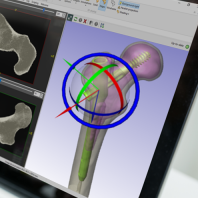 Simpleware ScanIP represents software for converting 3D image data (MRI, CT, micro-CT...) into models suitable for CAD, CAE, and 3D Printing applications in Orthopaedics. The software offers a complete environment for visualizing, processing, and exporting models from image data for medical device R&D and other biomechanics tasks. Simpleware ScanIP is 510(k) certified as a medical device.